Some writing advice is so common it's practically a cliché, yet it still doesn't really tell us how to follow that advice. "Write what you know" is one such bit of writing wisdom. We've all heard it, all tried to follow it, but we often stumble over the best way to put what we know into practice. Kristina Riggle takes to the podium today to share some tips of using what you know (and could know) to your advantage. Kristina lives and writes in West Michigan. Her debut novel, Real Life & Liars, was a Target “Breakout” pick and a “Great Lakes, Great Reads” selection by the Great Lakes Independent Booksellers Association. Her other novels have been honored by independent booksellers, including an IndieNext Notable designation for The Life You’ve Imagined. Kristina has published short stories in the Cimarron Review, Literary Mama, Espresso Fiction, and elsewhere, and is a former co-editor for fiction at Literary Mama. Kristina was a full-time newspaper reporter before turning her attention to creative writing. She likes to run and read, though not at the same time. The evergreen advice for the aspiring writer is, "Write what you know." What do I know? I know how to be a 1990s newspaper reporter (used it: THINGS WE DIDN’T SAY) how to be a mother of children from newborn to teenager (used it: all of my books), how to play a stringed instrument (used it: THE WHOLE GOLDEN WORLD), how to be a middling yoga student (used it: THE WHOLE GOLDEN WORLD) how to work in a bookstore (used it: KEEPSAKE), how to work in a family business (used it: THE LIFE YOU’VE IMAGINED) and how fertility treatments work (used it: THE WHOLE GOLDEN WORLD). Without intending to, I'd strip-mined my ordinary middle class existence. With prompting from my literary agent to stretch my creative wings for Book Six, I decided to write a novel about Broadway songwriting in the 1930s. Great! Trouble was, I knew so little about the topic that I didn’t know which Gershwin brother was the lyricist. Thus I began VIVIAN IN RED knowing nothing whatsoever about being a first-generation Jewish American piano playing lyricist son of a tailor raised in the Bronx of the ‘20s and ‘30s. I was terrified, but also tired of writing what I knew. So, how in the blazes did I do it? I picture my research process beginning with a wide angle camera lens, surveying the broad landscapes of my topics: early 20th century New York City, Jewish immigration, songwriting, the evolution of Broadway. Then the camera slowly zooms in to pick up individual details. 1. For the general research, I dove into books and old newspapers. I read a glossy coffee table book on the history of Broadway, meant to be a companion piece to a PBS series, chock full of fun pictures and anecdotes. I read a massive tome on the history of Jewish immigration into New York City and their culture as new and first-generation Americans. I also visited the big downtown library, which has old New York Times on microfilm, and scrolled through pages of articles and advertisements, which gave a feel for the news, life and language of the day. I found a book called SINCE YESTERDAY, written in 1939, about the 1930s, which was practically an eyewitness account, without the veneer of our romantic or simplistic modern viewpoint. 2. Then I needed more specific books. I found Philip Furia, an expert on the lyrics and lyricists of the day, and I read his work. I read biographies of songwriters who would have been contemporaries of my fictional Milo and took special note of their working lives and any specific information ever provided about how they wrote and how much money they made. I read a tattered autobiography, published in the 1960s, of a producer who would have been known to Milo, and then put him in the book. That’s Max Gordon. Eventually, I ran out of questions a book could answer, to say nothing of websites, which are helpful for certain purposes, but can’t provide enough depth, accuracy and detail by themselves. 3. For detail, I conducted interviews. I did a lot of reading up on being Jewish in New York at the time, but eventually my Gentile self had to risk revealing embarrassing ignorance by picking the brains of my Jewish friends--which I did, in great detail, and my friends were very, very patient with me. Most people are. Most people are so pleased you asked, and that you are trying to get it right. 4. Sometimes I just gave up. I lost a whole day’s work trying to determine whether an elevated train in early 20th century New York would create enough wind as it whooshed overhead to disturb someone’s hat. I had written a line where Milo grabbed his hat to keep it from flying off his head, then decided that might not have made sense. Down into the research rabbit hole I went, emerging hours later, blinking and confused as to where the time had gone, none the wiser about train wind. In the end, I just changed the line. No wind necessary; the train’s noise merely startles him. Could I have found someone who knew that answer? With enough time, sure. Would it have been worth the hours spent? In this case, no. This is just my process; I’m sure other writers have their own research strategies. But I hope my strategy of broad focus with general information, then zooming in your “camera” on details specific to your plot, can be useful to any kind of work—not necessarily historical—about which a writer starts out not knowing very much. As it turns out, “write what you know” is terrific advice. But you don’t have to limit yourself to what you know right now. Famed Broadway producer Milo Short may be eighty-eight but that doesn’t stop him from going to the office every day. 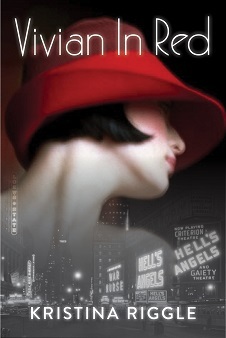 So when he steps out of his Upper West Side brownstone on one exceptionally hot morning, he’s not expecting to see the impossible: a woman from his life sixty years ago, cherry red lips, bright red hat, winking at him on a New York sidewalk, looking just as beautiful as she did back in 1934. The sight causes him to suffer a stroke. And when he comes to, the renowned lyricist discovers he has lost the ability to communicate. Milo believes he must unravel his complicated history with Vivian Adair in order to win back his words. But he needs help—in the form of his granddaughter Eleanor— failed journalist and family misfit. Tapped to write her grandfather’s definitive biography, Eleanor must dig into Milo’s colorful past to discover the real story behind Milo’s greatest song Love Me, I Guess, and the mysterious woman who inspired an amazing life. A sweeping love story, family mystery and historical drama set eighty years apart, Vivian in Red will swell your heart like a favorite song while illuminating Broadway like you’ve never seen before.